Bigwig first set up on 26/Aug/98, last updated on 01/Sep/08. This page is dedicated to furries. Those, whose mind or personality is not captured in the behavioral patterns of human society, but which can think in terms of animallike instincts, directness and sporting their animal character in virtual realities, drawings or real life as well. 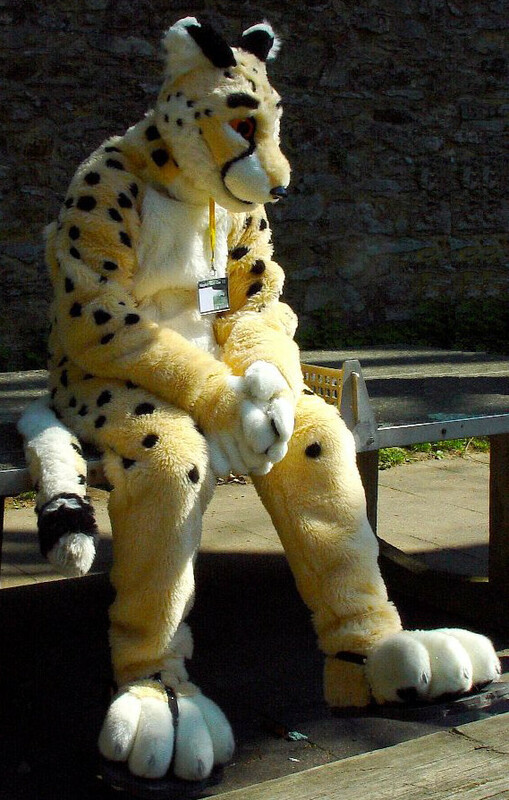 You find us roleplaying on Mucks, chatting on IRC, drawing art of our kind, on furry conventions and of course in plushie shops - to fill our homes with our most beloved furry species and feel them all around whenever we close our eyes against the human world and open our mind to the furry universe. Birds of a feather flock together - and so it comes to no surprise that regular gatherings are quite popular in the furry fandom. It is a good opportunity to meet likewise minded friends in real life, and allows to live some of your furry characteristic behavior in reality. May it be sporting your character on T-Shirts, by body painting or in a partial or fullbody fursuit. 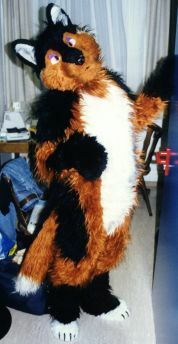 The first fursuit I did on my own was named as my character 'Bigwig' (first shown on EF9) which you can see on the left. I did it on my own with some help of my mate. While I was happy with the look of the head from the front this was not the	case from other angles and especially not from inside: The head was simply too bulky offering only a tiny viewing angle and under clear sky I turned completely blind due to the white grid I looked thru. To fix this the eyes got open pupils and optionally red illuminated (without affecting looking thru at daytime) two years later. It got retired after EF13. My second incarnation was created by Hawthorn (first showup on FC2008, picture on the right hand side taken by Tioh) and is named Shadow-Hunter. This head allows almost half the normal viewing angle and gives you the feeling back to see the world outside rather the inner parts of a fursuit head. This head has almost no air volumina inside but consists of reticulated foam (venting some air thru) allowing to survive dancing even though in contrast to my prior suit havening no active ventilation at all. Fursuiters and furry art are maybe the most perceived attributes of furries on the media. Anyone knows mascot-style fursuits from big sporting events or university teams, however there are realistic fursuits too. Furry pictures can be found in comics and most animation movies as well. While these manifestations of furriness are well known in general, the interest of adult people is not always limited to what seems appropriate for the PG13 audience. The association of kids surfing the internet confronted with adult stuff which can be found in some parts of the furry fandom often results in bad press. Meanwhile many avoid media reports in general. On Mucks - virtual reality worlds - furries can leave behind any limits and create their own environment and characters for roleplaying in it. The user interface is usually text driven so your own imagination is necessary to let your in-role character live in your fantasy - comparable to diving into another world when reading a fantasy book. Usually a few player retreat to a private room for playing a few hours together. What makes it so special and can make it addictive too is to write the story partly yourself while being confronted with the action of the other roleplayer. The system and themed public meeting places provide a mean to find others sharing your interests. 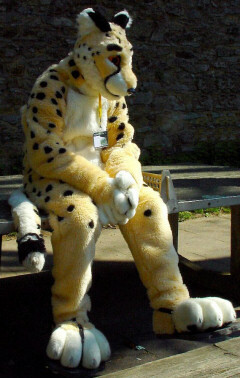 Conventions are mostly populated by furries which like to behave furry to some degree in RL too. So be prepared for some hugging and scritching from furries you never saw before. It is simply the furry-like approch to each other. 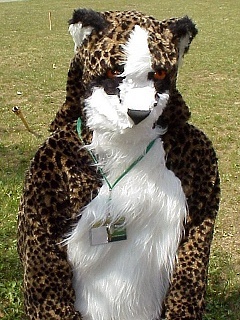 Some fursuiters might be in character being leashed by their owners and many furs will wear tails. There is a quite dense program at Conventions so you are quite busy visiting all those SIGs (special interest groups) e.g. dealing with how to built fursuits, how to draw furry-art on paper or on T-Shirts, how to live with real furries like wolves or leopards or why some humans are furry at all. To make contact easier furries wear badges, telling their in character name and sometimes showing drawn pictures of their alter ego as well. Here are some photos taken at my first Convention Eurofurence 4 located at a campground in the Netherlands with about 70 attendees. The very first morning a shy hugging ended moments later being burried alive by Skunki - my first fursuit encounter. Fluffy fur all around and somefur which took even pictures of this unforgettable moment. My next vacation took me to the USA so I integrated a Confurence 10 visit into it. Unfortunately I took soooo many pictures - I not yet managed to find the time to scan all of them except for those of the Confurences 10 fursuit SIG. After those two Cons I continued the annual Eurofurence visits every year: Eurofurence 5 took place with 100 attendees at a lake near Berlin. Except for the obligatoric first evening campfire and SIGs there was a fursuit contest and as a special highlight, a live Furry Fantasy II concert playing many pieces of the Furry Fantasy II CD. At Eurofurence 6 in Goettingen, many new entertaining highlights were introduced including a professionally released Con-video and a pawpet show, the attendee number kept growing exponentially. The following year Eurofurence 7 was the first seriously themed convention I witnessed by means of the building which was a medival castle offering an unique charme. I joined the first time with my furry mate. Eurofurence 8 which was themed by the program rather than surrounding. "FIA" took care of the furry bunch very well and the guest of honor was absolutely outstanding, adding a lot storytelling to the program. My mate wore his rabbit fursuit Chez the first time which he had finished just in time for this con. Eurofurence 9 was quite a surprise as it was in Czech which was not yet part of the European union. The number of attendees dropped sharply to about EF5 level. 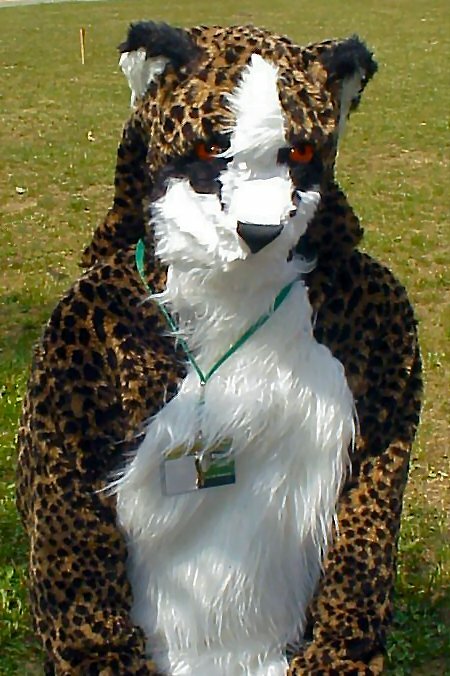 This was a special Con for me as I wore my selfmade fursuit which I had completed just two hours before entering the train. I am very lucky with the outcome of the facial expression, which my mate helped me to form. You can see the picture at the very top of this page. Some more scanned prints can be found here. Eurofurence X celebrated it tenth anniversary in Olpe. The theme was "at the movie" and there was a pawpet team playing the "phantom of the opera". There were a lot of different stage settings which resembled the progress of the breathtaking adventure our heros had to pass thru. This will be very hard to top in future... Additionally there were lessons to learn in animation technology presented by the guest of honor Timothy Albee and other young students of animation. 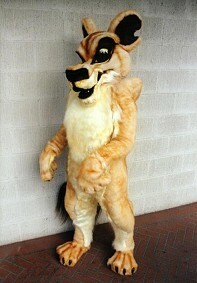 In 2005 I decided to find out about the smaller Convention MMC8 which had much less attendees than Eurofurence. It was a bit like a trip back in the past. The program was not so dense and there was more ample time to talk to each other. I enjoyed the pathfinding mission and the subsequent little fursuitwalk very much. Quite different was Eurofurence 11 which was located the first time in the middle of a city. This made it very easy to buy additional food but there was no green land around. The tradional campfire took place on a single BBQ fire in a tiny backyard and the incredible long row of hungry furries folded multiple times. The higlights of the showprogram included Heather Alexander, "2 the runting Gryphon", Uncle Kage and the most amazing and longest ever pawpet show. My most favorite animation movies is "Watership Down". Reading the book revealed an even more detailed world of its own and for any reason I choosed Bigwig's role which I loved to identify myself with most. Hence my in-character name I had choosed on Furry Muck many years later crashing quite unprepared into the first extreme furry episode of my life. Mucking was so fascinating that I stopped any other RL activities: For a year I played as much at the evenings and the weekends as I worked during the week, the remaining time was just for sleeping, eating and commuting to work. So be warned, entering this world of its own rules and fascination, can be an addictive and extremely time-consuming hobby. Watership Down is special regarding the fact that the scenery it describes actually exists. Richard Adams lived there himself accurately describing the beautiful landscape. 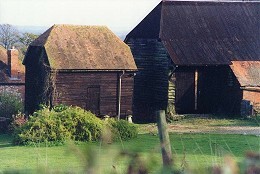 It lays about one hour drive to the east of London Heathrow. Using coaches you can leave either at Reading taking the bus to Newbury or leave at Basingstoke taking a bus or taxi to Overton which is just a few minutes on foot from the beginning respectively the most southern point of the Watership Down area. In Newburry you will find an excellent tourist-information center which can help you to find a bed & breakfast accomodations or maps. Kingsclere, located less than 2 miles east of the Watership Down hill, is easily reachable by bus from Newburry. I had a very nice stay at Mrs. Philips' bed & breakfast place there. Kingsclere is a perfect place to start when you don't have a car as it lies just in the middle dividing the area perfectly into a nothern and southern route, you can hike in one day each. Even if you are a poor hiker like me you will find that the beautiful and the stunning smiliarity with the pictures of the animation movie makes you forget about anything else - including time! Don't get lost in the dense woods of Laverstoke after sunset like I almost did, better start early and choose one of the longer summer days. If you ever can make it close to London this area is a must-have-seen for any Watership Down fan. Read these hints and as an appetizer for your own hike On the track of Watership Down watch my album showing the Watership Down location looks like a quarter of a century after the book had been written. If you enjoyed "Watership Down" you won't like to miss out "Plague Dogs" which is written in the same anthropomorphic style and deals with two dogs which have escaped from a research-labratory trying to survive on their own in the mountains of the Lake District. Again this is an authentic place on the east coast of England opposite of the isle of man, where Richard Adams spend some time of his life too. However this is not a happy story you would like to share with your children. Again the book has some more details and differs slightly from the movie which has a more sudden and dramatic end. Well the distances which the dogs run are larger than the 30 miles covering the range of Watership Down, probably it takes some more days or a car to see all the spots there. There is another great furry book I have to emphasize here. It is "Tailchaser's Song" by Tad Williams, which tells the thrilling adventure of two cats seeking to find out about lost members of their community. They encounter many threats on their way and eventually get captured under earth finding the cruel answer not before it seems too late for themselves to escape. However they get help from an extremly unexpected side. I know you will get a gooseflesh when reading this - I get one when reading books anytime when many incidents suddenly form a conclusive story or things suddenly turned out to be completely different than you thought all the time. There is a very good abstract as well as a nice picture on the cover of it. Click on the little picture to get it full sized and read yourself! Many thanks to Lizard for hosting the lion share of my convention pictures free of charge using sophisticated album scripts for different resolutions! Many thanks to Ch'marr and Bang for hosting this webpage and many more pictures on their server. Greetings to all of you furries down under! Any feedback or criticism about my private webpage? Let me know! Disclaimer: I have no influence or knowledge of the pages the webring links lead to, so I cannot be held responsible for their content.